Shanghai is hopeful that the Global Champions Tour will be a long-term annual event in the city, as a permanent equestrian venue is in the works in Pudong's Houtan area. SHANGHAI is hopeful that the Global Champions Tour will be a long-term annual event in the city, as a permanent equestrian venue is in the works in Pudong’s Houtan area. The makeshift venue in front of the China Art Museum staged the three-day Shanghai Longines Global Champions Tour over the weekend, bringing together more than 60 world-class riders and their adorable horses. Shanghai was hosting the five-star show-jumping event for the fifth year, with the event to be held in the city until at least 2022, according to the contract. “We are planning to build a permanent equestrian venue in Pudong, which will hopefully keep the Global Champions Tour as a long-term event for the city, just like the tennis Shanghai Rolex Masters and F1,” said Yang Yibin, general manager of the organizer Juss Event. According to Yang, the city government is still working on the design for the venue, construction for which is expected to start next year. The Shanghai event was blessed with fine weather this year. The final competition yesterday afternoon saw a familiar face on the winner’s podium — 2017 champion Harrie Smolders of the Netherlands astride horse Monaco won the Massimo Dutti Trophy again. They beat Briton Ben Maher with Madame X and Germany’s Maurice Tebbel with Chaccos’ Son, who took second and third, respectively. The top three were split by less than a second. In the morning session, young Belgian Constant van Paesschen rode a sprint finish with his horse Compadre van de Helle to win the 1.45-meter speed class. On Saturday, another Belgian, Gregory Wathelet, and the gallant grey Coree set a jaw-dropping pace early in a 12-rider jump-off, seizing victory in the Longines GCT Grand Prix of Shanghai which saw the highest obstacle set at 1.60 meters. The victory gave Wathelet the third ticket to the new Longines Global Champions Super Grand Prix at the new GC Prague Playoffs in December. 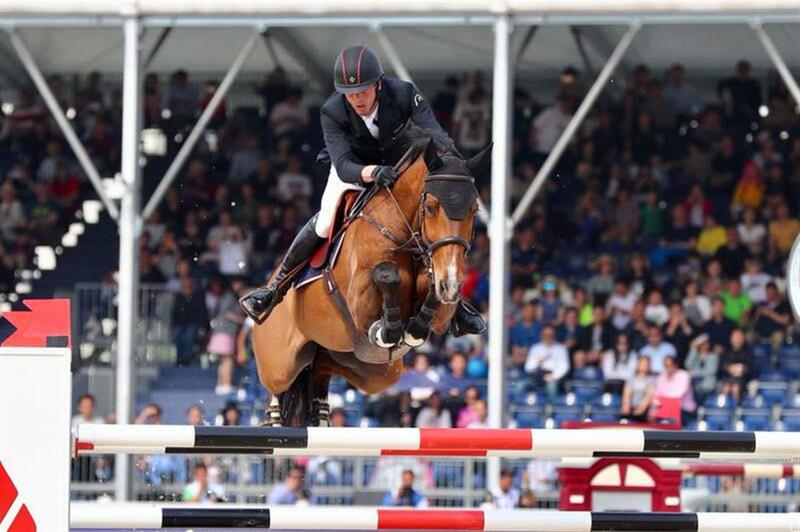 Earlier on Saturday, the London Knights duo of Emily Moffitt and Ben Maher stormed to a Global Champions League Shanghai win by 27 hundredths of a second, taking the lead in the overall ranking. Monaco Aces’ Simon Delestre and Jerome Guery took second, followed by Chantilly Pegasus’ Roger-Yves Bost and Dayro Arroyave. The next leg of the tournament will be held in Madrid, Spain, in 2 weeks’ time.